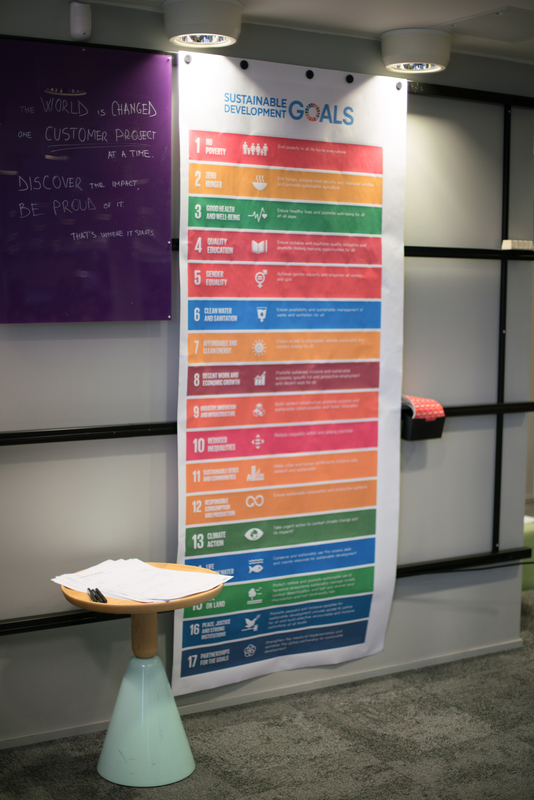 How does a company take United Nations Sustainable Development Goals beyond the annual CSR report, into the core of their strategy and into the hands of each and every one of their employees? How does one make SDGs stick? United Nations’ Sustainable Development Goals have seen good adoption, well beyond their original scope. They are now used not only by UN and member countries, but also by cities, nonprofits and corporations all around the world. In the corporate world, SDGs are mostly known to the CSR department and mostly present in the annual CSR reports. Highly isolated from the main business and mostly invisible to employees. This is all fine if you see business and world impact as separate and separable things of a company’s operations. They are not, though. They are deeply interrelated. The only thing separable is the attention given to them: you can have a lot of people focus only on business and some people focus only on impact. That might just not be the best idea, either for business or for impact. So how does a company take United Nations Sustainable Development Goals beyond the annual CSR report, into the core of their strategy and into the hands of each and every one of their employees? How does one make SDGs ... stick? Email UN: ask for permission to use the SDGs as laptop stickers inside your company. Explain why you think it’s a good idea and how they should encourage all companies to do it. Go over to the UN website. Get the SDG graphical assets. Find a good printing house. Order stickers. Stickers arrive. UN permission arrives. Make laptop stickers available to all employees. Explain why and how they’re meant to be used. In order to get an SDG sticker, you need to have done work that supports the respective UN Sustainable Development Goal. Of course, no one will verify it. It’s enough if you believe it has. And you don’t get the sticker; you take it yourself. Let’s take Hanno for example. Back in the day, he’s helped with Helsingin Energia’s digital transformation. Among other work, he’s contributed to them starting their solar business from scratch. Solar is clean energy, so sounds like UN SDG 7, “Affordable and clean energy”. Has Hanno “ensured access to affordable, reliable, sustainable and modern energy for all”? Of course he hasn’t. But he’s definitely made his contribution to it. That deserves a sticker. Let’s take Hadrien’s example. He’s working on our FIBA case; FIBA (Fédération Internationale de Basketball) is in the process of making 3x3 basketball an olympic sport. Creating the supporting digital tools is an important part of that process. Hadrien is proud of the project, as his work reaches millions of people. But he’s not entirely sure about the impact part–it’s just a sport after all? He takes the canvas and another team member. They do some thinking together. Hadrien comes to realise some hidden impacts of FIBA’s efforts: for example, 3x3 getting more serious makes it a bit more likely for teens in certain contexts to take up basketball as opposed to conflict, small crime or substance abuse. It creates positive role models. It promotes a healthy lifestyle. It creates healthy entertainment. It build community. Sure, there’s the gambling side of it, present in most serious sports. There’s an environmental footprint. What does it all mean to Hadrien and how can he use his role to increase the positive impact and decrease the negative? That’s up to him to decide. In terms of stickers, he could probably take “SDG3. Good Health and Well-being” and “SDG16. Peace, justice and strong institutions” and wear them both with pride. 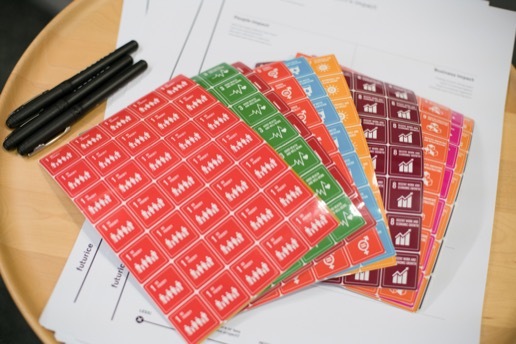 Why would a company want their employees to stick SDGs on their laptops? And why would employees do it? Here’s the thinking process that got us here. Societal impact is not a CSR’s job. It’s everyone’s job. This is obvious to us, but perhaps not obvious to everyone: A company’s impact on the world comes through all the services and all the products the company is putting into the world and every single action of every single employee of that company. Sure, the CSR department has a big role to play as the champion of societal impact, both in board discussions and in employee engagement. But to think they are the only, or even main responsible for the impact ... is just silly. This is, I think, common knowledge: focus on getting a raise and you’ll eventually get a raise. Focus on profits as a company and you’ll likely get profits (well, if you’re good, that is). Possibly at the expense of many other things, but you can do it. At Futurice, we’ve always been focusing on employees, numbers, clients, now and in the future. It’s given us a healthy balance and made our success sustainable. Out of these, numbers (=money) may often seem to get more attention as they are so...quantitative. Employee satisfaction is slightly less reported on, but clearly in the core of any strategy we’ve ever had and relatively easy to follow and understand. Client satisfaction may be the least proactively measured of the three over time, but always present via verbal feedback from clients, professional pride and ambition connected to that feedback. And of course career progression associated with work well done. How about societal impact then? How do we add that to the mix? Societal impact is hard to measure, but not hard to focus on. Measuring societal and environmental impact is hard. Even with our Chilicorn Fund (pro-bono) projects, we learned early on that properly measuring the impact could be so time-consuming as to take most of the initiative’s “admin” time and leave very little for moving stuff forward. Multiply that 300 times and you get the scale of the challenge of measuring the whole of Futurice’s impact. But is measuring the only way to focus on something? Of course not. 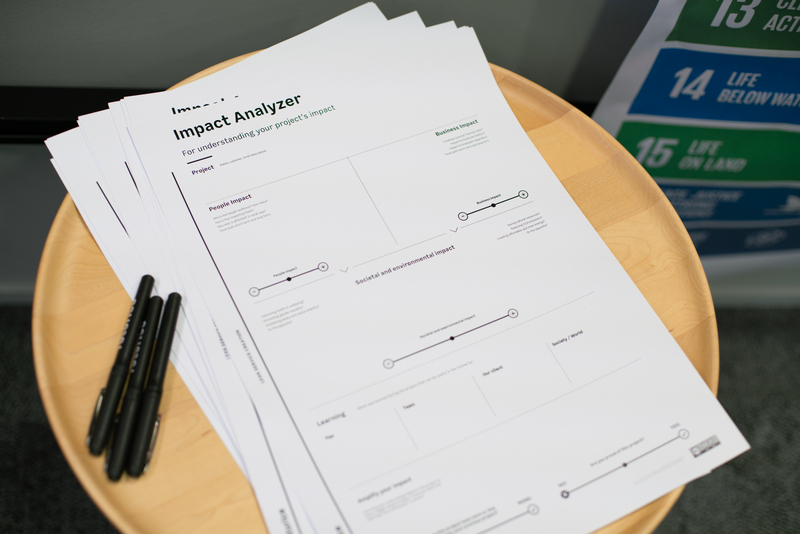 This is where the Impact Analyzer Canvas comes in: to understand the impact of your project (beyond the superficial level), you need to actually put some thought into it. By asking the right questions and taking the time to reflect on them, you may get new insights into how your project is helping the world, or harming it for that matter. And with those insights, you are in a much better position to effect positive change. 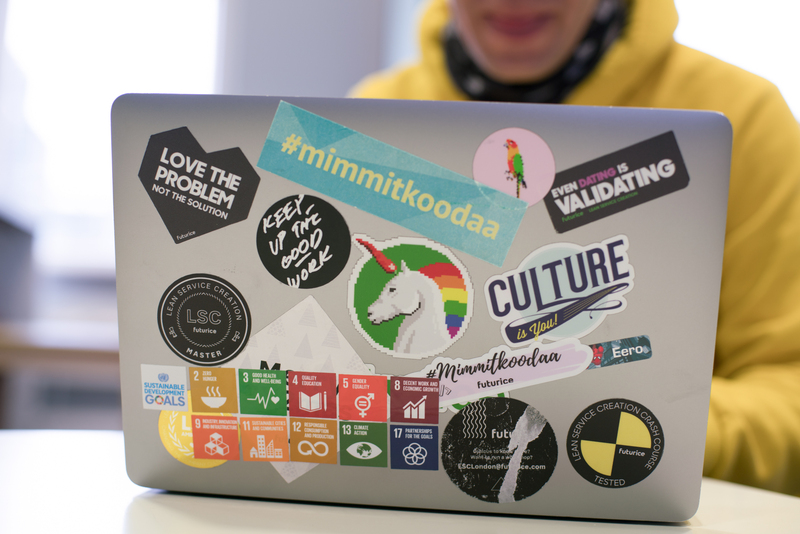 At Futurice, we love stickers. You’ll find them on most laptops, in different configurations. There’s stickers for brands, sub-brands, office brands, slogans, jokes - you name it. Changing laptop is a somewhat emotional moment: letting go of the old stickers and starting anew. No wonder: the need for self-expression runs deep in everyone, and for our professional setting, the back of the laptop seems to be the best possible place for it. Through stickers we show what we stand behind, what makes us tick, what makes us proud.